the big night.. - A mummy's inane blabberings.. 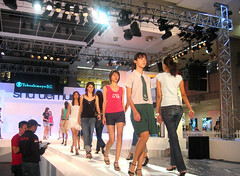 The first night of rehearsals at Takashimaya..
some of the girls came in their school uniform! It's been a crazy week! Spent the whole week attending to the preparation for the big night - The New Paper New Face grand finals which is taking place tonight at 7pm!I'd actually just came back from Takashimaya where the girls were rehearsing for the show. They finished at about 12 midnight but I had to stay on longer due to the car display setup. 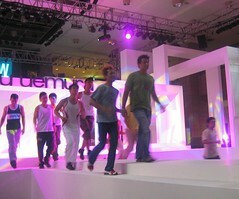 Rehearsals started late because Shu Uemura had a show on and it ended abt 9pm. 2 of the girls are having their exams later in the morning and another's boyfriend going out of town that night and she was supposed to send him off..But no choice! The show had to be perfect and Daniel Boey, who's the fashion show choreographer made sure they had all their routine down pat..Even the dancers and professional male models were not spared as they faced the wrath of Daniel if they got their steps wrong! He is such a perfectionist and it does reflect in the end result. From the rehearsals, you can tell that it's gonna be a great show! And we have Denise Keller as MC and Electrico will be playing too.. I still don't know who will win even though I've been with the girls at all the rehearsals and seen them improving day by day..It's quite fun being their mother hen.. At times, I do really feel like their mommy, having to discipline them although my boss says I'm too lenient :P.Most of them are 20 and below..so young and full of life! It's really been an interesting experience working on this event. Can't believe how fast time flies..So cliche I know but it does seem like auditions only took place recently and it's the grand finals already! My boss said to me that I've basically covered 2 of the biggest & more siong event this year with GSS and New Face so working on any other promo after this should be a breeze. Well, I guess I can thank my weightloss to these hectic projects! Gotta be back at Takashimaya at 7am later..Yeah, I should be sleeping now..sure gonna be quite sotong tomorrow! Gonna be a busy day for sure..am glad it's gonna be over soon so that I can finally rest. Taken just a few hrs ago.. The male models & dancers were included in the rehearsals..
That's Mark Chay, the swimmer in front..
Daniel, giving instructions to the girls/models/dancers.. Some pics with the girls after their fitting session! Cass & Sophie who came in their uniform. Sophie is the youngest at 15! with Dympna, Pie Ling, Gwen & Conelia.. The downside of it all..I barely had much time with Aidan. Hubby was outstationed since Monday [timing was really bad] and the boy had to spend his evenings with Nenita since I've been coming home after 10pm almost every night. She told me that he kept singing "Where is mommy? Where is mommy"..But he seems to understand as he said to Nenita "Mommy where? Mommy work work?" And yesterday..he suddenly developed high fever..about 39 degrees! Fortunately, his fever subsided after he was given some meds..He's still a li' feverish now but behavior wise, he's okay but just gotta monitor him. I think it can be quite worrying during this period with the dengue scare. Times like this makes me feel very guilty...I know I can choose to be a sahm if I want to. Hubby earns enough to feed all 3 of us (though he may have to pray for an increment soon by the rate Aidan's eating)..But having gone thru 18 months of being a stay-home mom, I honestly don't think I'm cut out to be one. Yes, it is great to be with my child, being able to guide him through his formative years. But I find myself getting bored & restless easily...also started to let myself go and my self-esteem plummeted.. I guess I just need to be be active/busy. I hope Aidan understands that as he grows older and wonder why I cant be home with him more..
oh, Lynn is my friend's girlfriend! :D she's really pretty eh? 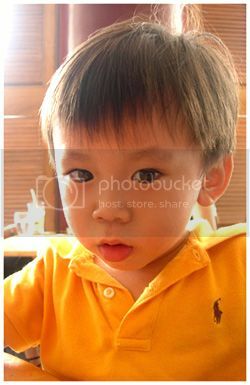 and aidan looks so cute in the yellow polo. this shade of yellow/orange looks very good on him~~! Lynn's really pretty. And such a sweet personality too..She got 3rd place and won two subsidiary titles too. Was a fave with the judges..
Don't you think Cassandra looks like triciaseow???? hmm..cant really see it though. 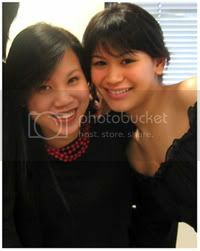 Tricia's face is much sharper i think..
You still can post this at 2am. If me I would be in bed. Got try working only half-day or not? Ah, we both quit our jobs and be SAHMs together lah. Or hey, we could start a business! Haha. Eh, Samsung skate how ah? Shall we just go ECP and roll around? I like what i do but i can be very scattered brain too. Im lucky that i have pretty good bosses so far and interesting projects to handle. Thanks for your help yesterday. Sorry i couldnt give u much directions coz i was so gawd damn busy! I am sure Aidan will understand your decision. I think what's important is you must be happy, happy mummy = happy family. You cherish all time now that you have with Aidan more and I am sure he looks forward to seeing you too. Sometime, facing a child the whole day doesn't neccessarily means it will make the child happy. Especially so if the mummy is bored. Hey many of the girls are actually very pretty! And very good figure too!!! Heh..small world eh. She got 2nd runnerup..and definitely deserving of the title. Won 2 other subsidiary titles too! aidan is so cute. where is mommy? where is mommy? mommy work work? men..tsk tsk. all the same heh! Tell him the girls too young for him! "(though he may have to pray for an increment soon by the rate Aidan's eating)" - this was just too funny! Hehe. 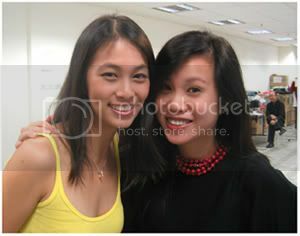 heh i did finally return ur sms leh..a bit late though hehehe..Glad that you could make it for the event. Hope u enjoyed it and thanks for the gift although it's still with don coz i couldn't hold on to it then. we have lunch soon eh! I saw my sch uniform in your first picture!!! So poor thing, must be very tired after a long day work and somemore need to worry about aidan fever, Must take care of yourself and also aidan too. Anyway tonight i will be going to Taka and maybe can take a look at the show. Aidan will know his mummy need to work so hard to buy him toys :) but he really very cute, still can use singing to ask where is mummy thinking of meeting aidan one day. you should see them at the finals itself. they were all stunning :) so proud of them. *sigh* hanor...! some of them tower over me, even when im wearing heels! oh boy those girls are so leggy and slim !!! don't forget very young too. Aidan looks much slimmer. Hope he gets well soon. Aidan lost quite a bit of weight recently *sigh* gotta find ways to fatten him up but it's not like he hasnt been eating alot!